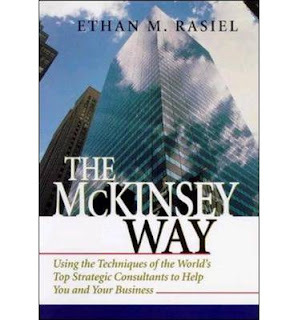 The Mckinsey Way written by Ethan M. Rasiel provides a good insight about the company, its consulting processes, some of the frameworks, life of consultants and tips for aspiring consultants. McKinsey & Company was founded in Chicago in 1926 by James O. ("Mac") McKinsey, an accounting professor at the University of Chicago, Booth School of Business, who pioneered budgeting as a management tool. The Firm promotes clarity of thought and expression. Every document has to follow the MECE rule: mutually exclusive and collectively exhaustive. The consultants try to solve a problem to the highest possible extend at the first meeting itself: Creating an Initial Hypothesis(IH). To structure your IH, begin by breaking the problem into its components - the KEY Drivers. Next make an actionable recommendation regarding each driver. Later breakdown each topline recommendation into Benefits & Issues. The above exercise will lead to an issue/solution trace. For testing the IH, recheck all the IH of team members; check for other possibilities. -> Understanding the 'right' problem is the key. -> Don't reinvent the wheel. Every problem will be similar to another; but at the same time unique. - Learn to say "I don't know"
The second part of the book talks on 'The Mckinsey way of working to solve problems" i.e how Mckinsey implements the model in a day to day basis by going through a real life like case. Ethan argues that the right way to sell a service or a product is not to barge into your customer with samples and glossy pictures of benefits; but to be there at the right time and make sure the right people know who you are. 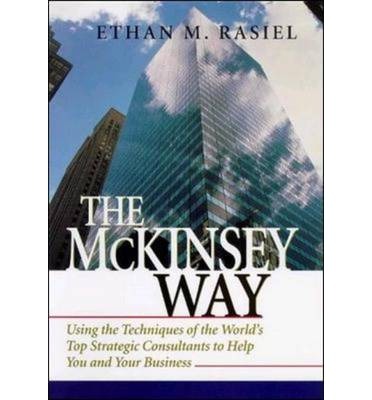 Mckinsey never sells or advertises, it markets by very valuable insights and publications. Set definite milestones which you can achieve. Don't give false impressions. An interesting advice is "The first rule of success in a hierarchy is: make your boss look good. To please your boss, do your job well. Keep your boss informed, but not overloaded with information." All work done, but without presenting it well, there is no use! How to become a good product manager?